No misgivings of any substance here. Rapture, joy, nostalgia and impact combine across these three works. Each is a product of the Great War and of the joys of glancing and gazing back at the pre-War days. It’s notable too that the icy shivers and tarnishing blossoms in the third movement of the String Quartet No. 3 share a world with Warlock’s The Curlew. The bustling power of the finale of the Quartet reminds us that Howells, for all his access to pastoral ecstatic states, could be brusque, dynamic and exciting - something also apparent from the explosive Sanctus of the Missa Sabrinensis and the outer movements of the Piano Quartet. It also recalls the dust-raising stamp and stomp of the central movement of Moeran’s Violin Concerto. The music is given with throatiness and abrasion as well as English honey; the latter reflected in the murmuring soliloquy of the first movement. The less familiar Lady Audrey’s Suite is also in four movements. The liner-notes mention inspiration from Debussy’s Children’s Suite (golliwogs are referenced in the first movement) but the music is also Ravel-like (the String Quartet). The score was written for Marion Scott’s young niece and there are words to accompany the ‘pictures’ that Howells associated with each movement. The third movement, in a Sunday church setting, is, for the most part, suitably reverent. The finale picks up on the bustling power of the two so-named Quartets. The Suite, though far from inconsequential, provides a degree of remission from the extremes of emotion between the two half hour quartets. The Carnegie-award winning Piano Quartet is dedicated “To the Hill at Chosen and Ivor Gurney who knows it.” It’s related in its breathless full-heartedness and heady mood to In Gloucestershire and also to the instrumental writing in Gurney’s two Housman song-cycles. Tumbling energy is a dominant aspect of listening to this reading of the Piano Quartet while its Lento, also marked Molto tranquillo, plumbs healing peaceful depths in a way unique among these three works. The Goulds and David Adams want nothing in terms of passionate engagement and make for an utterly convincing and elevated conclusion. For all its 1970s vintage I still lean slightly in favour of the acoustic transparency of Lyrita’s full-price analogue version but it’s on a CD running to just 53 minutes. The entirely well-suited notes are by Jonathan Clinch who has done so much work in the service of Howells' music and promises to do more. The Naxos project was financially supported by the Howells Trust and Society and by the Royal Welsh College of Music and Drama and it much redounds to their credit. 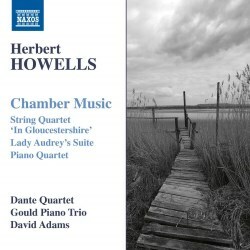 This joins Naxos’ other Howells chamber disc.